.. there are 10 million+ population cities in the U.S. .. each is reviewed in some detail in this section .. the change in U.S. city population from 2010 to 2015 ranged from growth of 357,979 in New York City to a decline of in Detroit, MI. New York City is actually five counties; the next largest city growth was Houston, TX with a 181,463 population gain. See cities with largest growth or decline using the interactive table. The July 1, 2015 Census Bureau model-based estimates for the U.S. 19,505 incorporated cities show a total population of 202,066,769 compared to 192,179,239 as of Census 2010. These areas are incorporated cities as recognized by their corresponding state governments and granted certain governmental rights and responsibilities. ProximityOne integrates these estimates, with related data, in models to develop projections, examine change and assess the impact of change. The largest 10 cities in 2015, shown by this graphic taken from the interactive table below, are also the set of cities having 1 million or more population. Locations of the largest 10 cities based on 2015 population are shown in the following graphic as red marker. 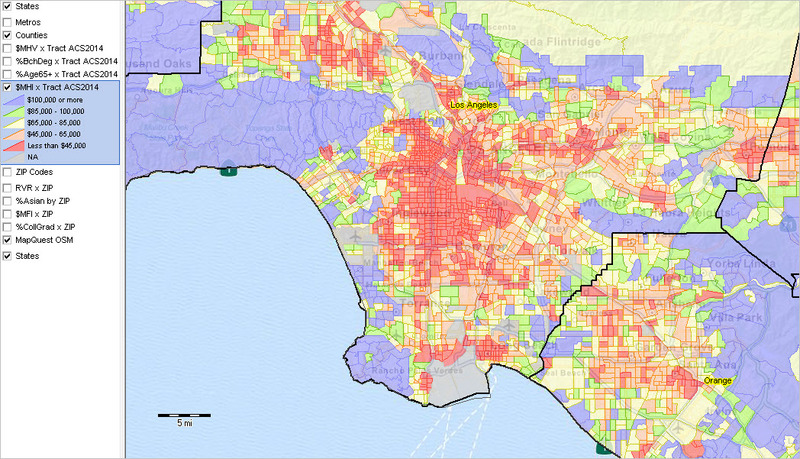 Examine demographic-economic attributes of these cities using these related individual city-focused sections. 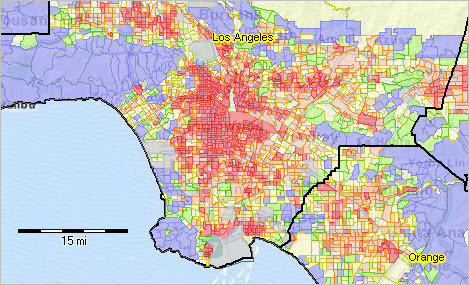 These sections compare the city boundary/location with corresponding urbanized areas and include extended data from ACS 2012 and ACS 2014 1 year estimates presented in a comparative analysis format. Use the CV XE GIS software with city/place GIS project to examine characteristics of city/place population, 2010-2015. The following view shows patterns of population percent change, 2010-15, by city in the Charlotte, NC/SC metro area. 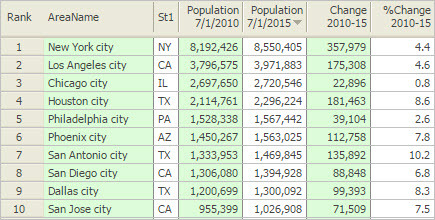 Individual million+ population city sections will be updated and the topic of separate future blog posts. Follow this blog to learn about updates to these and related sections. .. Combined Statistical Areas are aggregates of adjacent metropolitan areas; they are groups of contiguous counties that have demographic-economic affinity. These 166 areas are important in market research and development for several reasons. Based on the 2015 population estimate, these areas include 244.1 million population of the total U.S. population of 321.4 million (76 percent). 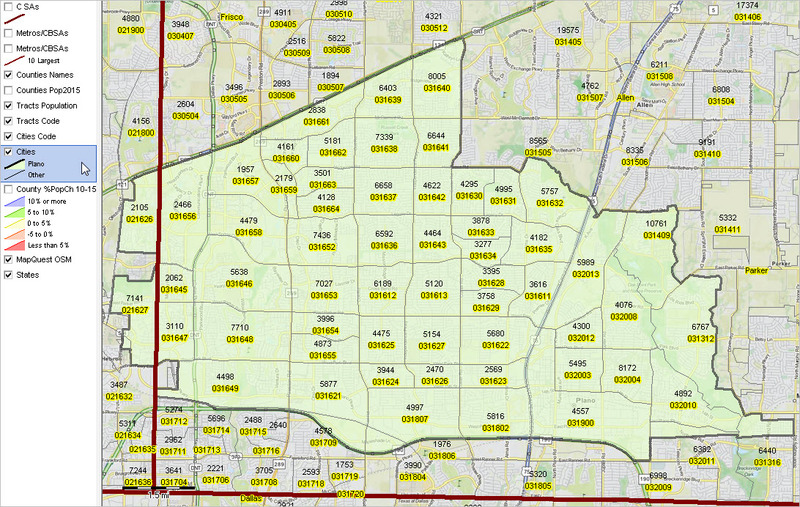 CSAs are at least two adjacent metropolitan areas — reflecting a larger and broader market area. Due to their size (of many), it is often possible to develop more detailed custom demographic-economic estimates and projections than at the county or metropolitan area level. See more below about CSA definitions and relation to other geography. 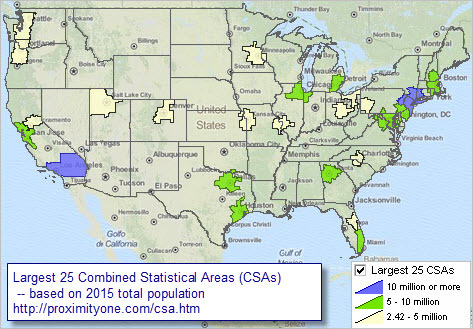 The following graphic shows the largest 25 CSAs based on the latest 2015 official population estimates. The intervals/colors are depicted in legend panel at left of map window. 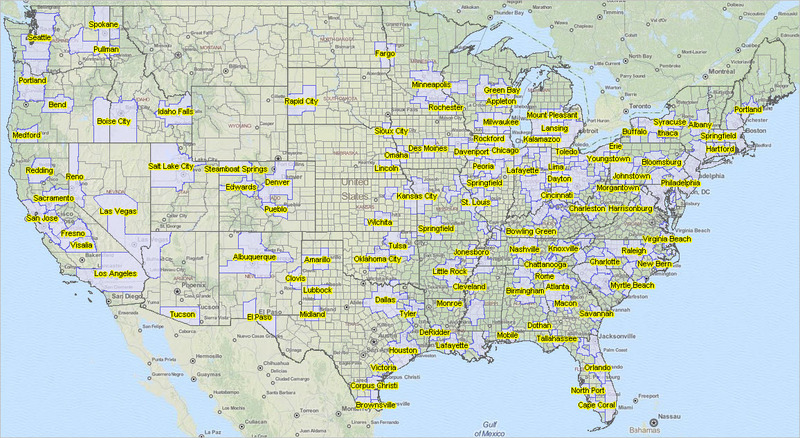 Create custom maps similar to this view for your regions of interest. Use the GIS project/datasets to examine alternative patterns such as percent change for different time periods. Set queries to include CSAs by peer group. Click graphic for larger view with more detail; expand browser window for best quality view. View developed with CV XE GIS software using the us1.gis GIS project. This section provides an overview of recent demographic trends among CSAs and provides access to tools to further examine these areas, markets, and demographic-economic-business related characteristics. Use the interactive table below to examine patterns and relationships among CSAs of interest. Use the GIS project and datasets described below to examine CSAs in a mapping and geospatial analysis context. As an example, the Houston CSA is comprised of the Houston MSA and four adjacent MISAs — Bay City, Brenham, El Campo and Huntsville — four relatively small metros. Compare this to the Los Angeles CSA — the “old 5-county LA metro” — comprised of three adjacent MSAs — Los Angeles-Long Beach-Anaheim, Oxnard-Thousand Oaks-Ventura and Riverside-San Bernardino-Ontario. The Los Angeles CSA is the second largest CSA (based on population) and more than twice the size of the 3rd largest CSA — Chicago. Use the interactive table below to examine relationships among CSAs. Click the ShowAll button then the CSA Only button to rank/compare CSAs. Click the ShowAll button then select the CSA by code button to examine the metro and county components of a specific CSA of interest. View maps for your areas of interest. Add other geography/subject matter. Modify content, color settings, labeling and other attributes. See details about installing and getting started in this section. The following graphic illustrates using the interactive table to view a list of the largest 10 CSAs ranked on 2015 total population. Click graphic for larger view. Use the interactive table to examine CSAs of interest. .. shapefiles are the most widely used type of vector-based geodata file type used Geographic Information Systems GIS. The shapefile structure, comprised of a .shp (geometry), .dbf (dBase-subject matter), ,shx (index file associating shp and dbf records) and .prj (projection), is in the public domain, well documented and used by many mapping GIS tools. 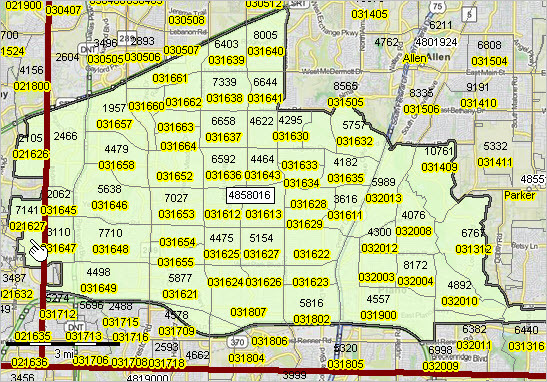 Many shapefiles, such as the wide ranging political, statistical and topographic Census Bureau TIGER/Line shapefiles, become available with no subject matter content or limited scope content. There is a persistent need to process the dBase files (.dbf) associated with shapefiles … adding data, computing data, linking data, updating data, etc. dBase, or dBASE or dbf, files have wide ranging appeal and use well beyond mapping and GIS applications. The simple and transportable structure makes them ideal for any type of textual or statistical data that is of conventional text or numeric form associated with data records with associated ID fields (social security number, member number, customer number, geocode, and many others) — where the need to support queries or develop relational data files structures is great. Compared to Excel, dBase files provide a smaller footprint, can be processed faster with some dBase application software and can support a larger number of records. This section briefly outlines use of the CVXEGIS Script feature. The Script feature includes the ability to develop programming-like code to process dBase files. There is no fee for the basic version of the Script feature. It can be used with any dBase file. The learning curve is almost nil. Install CVXEGIS and start using the tool. 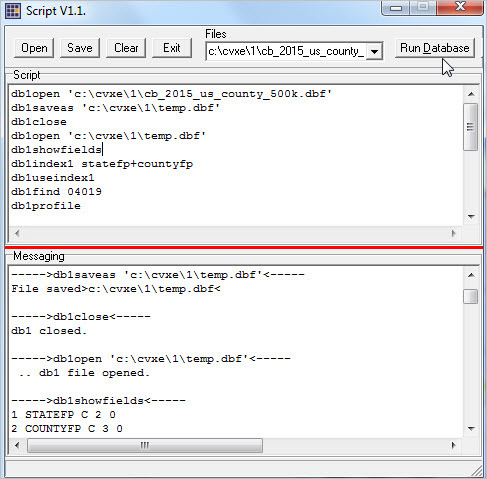 Create, manage code interactively; run the script as a batch file. Top section shows code; lower section shows selected output.